Many tall spires of white flowers. 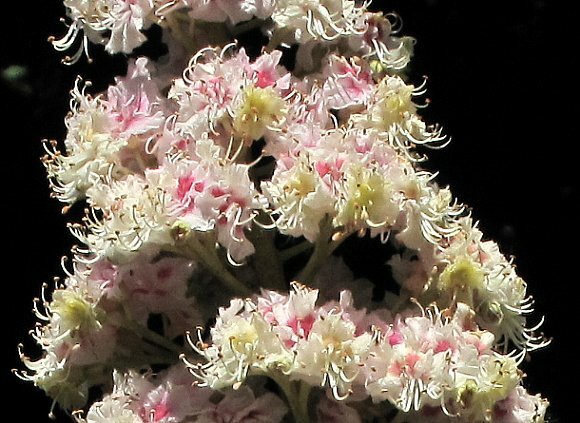 A conical spire of white flowers atop five to seven separate palmate leaflets. The white flowers have 4 to 5 petals with a touch of yellow within, which later turns to red as after the flower has been fertilised. The white flowers have 4 to 5 petals and a touch of yellow and red within. Yellow un-fertilized flowers turn red after fertilization. Individual flowers easier to see on young specimens where only one flower bud on each stalk has yet opened. Possibly because it is hermaphroditic, having the flowers of both sexes on the same tree, the red flowers appear different to the yellow flowers. The yellow flowers have larger orange-coloured bits on the ends of white 'stalks', whereas the red ones have smaller fawn-coloured bits. Your author doesn't know which ones are male and female. The red flowers seem to have two larger forward winged petals, with two smaller winged petals above and to the rear of those, with fawn-coloured anthers? The yellow flowers also appear to have two lower and two upper petal all with yellow splodges and orange pollen? If so, the yellow flowers are probably the male flowers, whereas the red ones female? Note that both petals and stamens are slightly hairy. 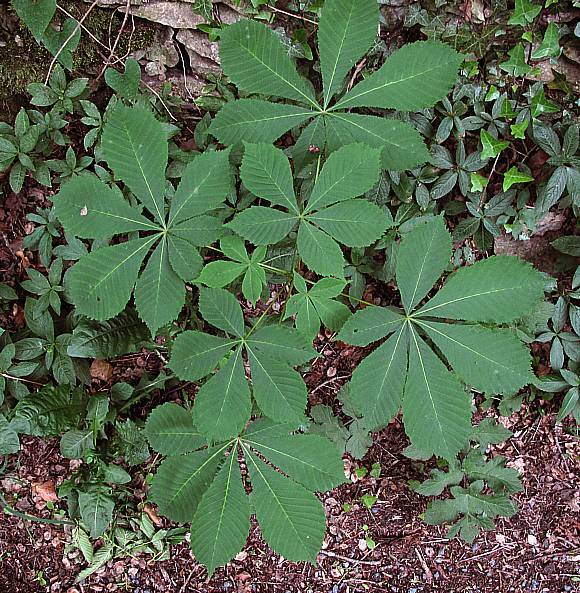 The leaves are palmate, with either five or seven separate leaflets. (By transmitted light). The leaflets are widest near the end, the largest leaflet being the middle one. (By transmitted light). The leaflets have herringbone patter veins, forwardly directed at 45° and a prominent mid-rib. (By transmitted light). The leaflets have many small irregular teeth on the periphery. (By transmitted light). House fly for size comparison. 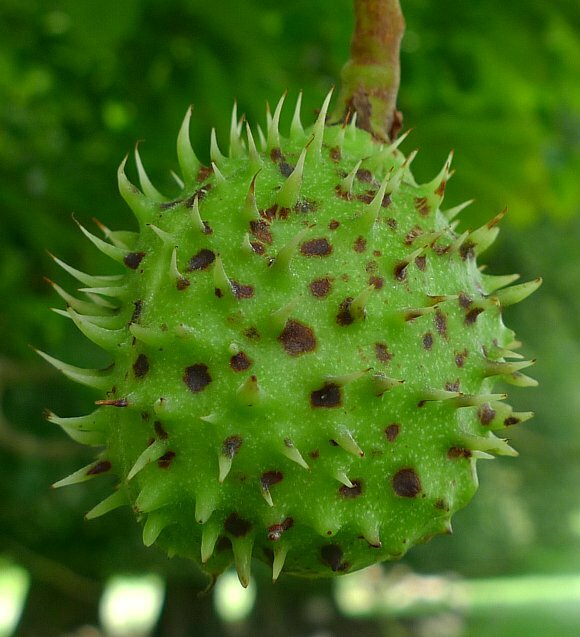 The 'conkers' are enveloped in a spiny casing, smaller than an Apple , but larger than a Crab Apple . The bole of the tree. 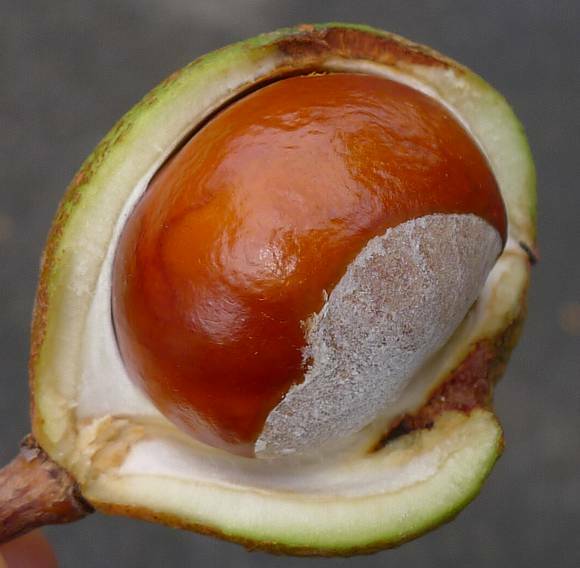 The 'conker' within a split-open casing. There is a white pithy substance covering some part of the conker. Some gamers bake their conkers in an oven to harden them whilst other soak them in vinegar or impregnate them with superglue, but these practices are frowned upon in conker competitions. Seedlings rarely progress to a tree. 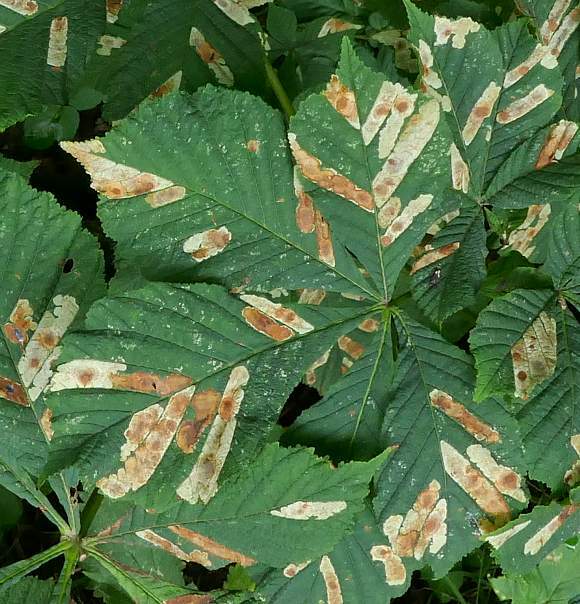 Leaf Miner Moth damage on Horse Chestnut leaves. There are various species of leaf miner moths in the UK and the same tree can become infected with a variety of moths as the seasons progress through the year. 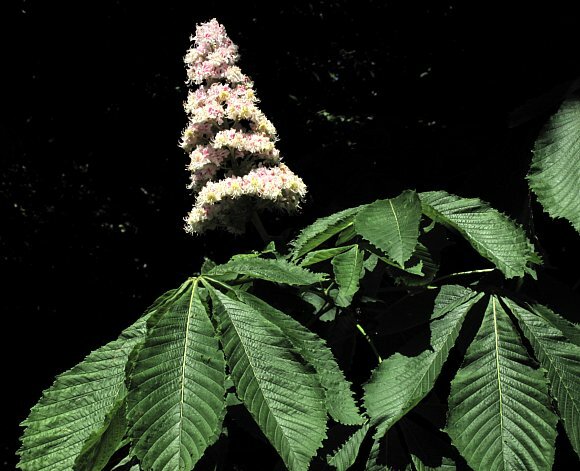 One commonly mentioned species in relation to Horse Chestnut trees is Cameraria ohridella. This sort of extensive damage, on every leaf of the tree, will kill it after just a few years. 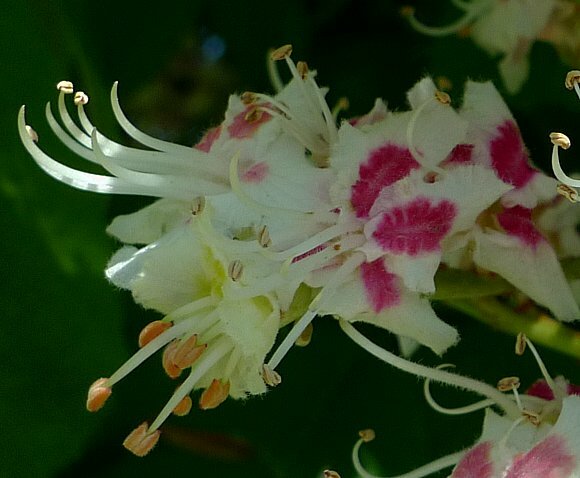 Some similarities to : Red Horse-Chestnut but that has red instead of white flowers. No relation to : Sweet Chestnut [a tree with similar name which belongs to the Beech Family] and from which chestnuts for roasting are obtained from. 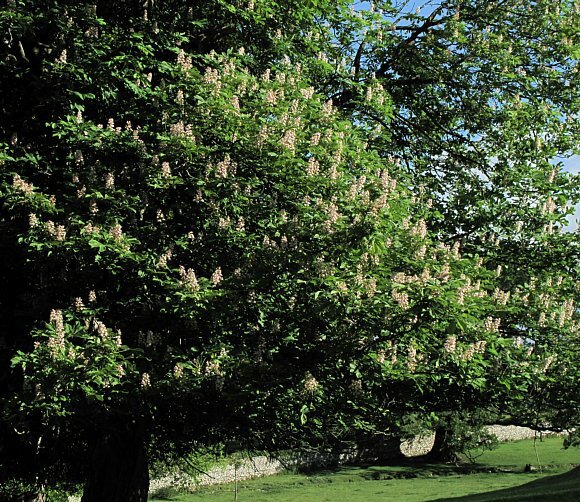 Horse-Chestnut trees are not native to the UK, but arrived here about 400 years ago as an ornamental plant for parks and large gardens. 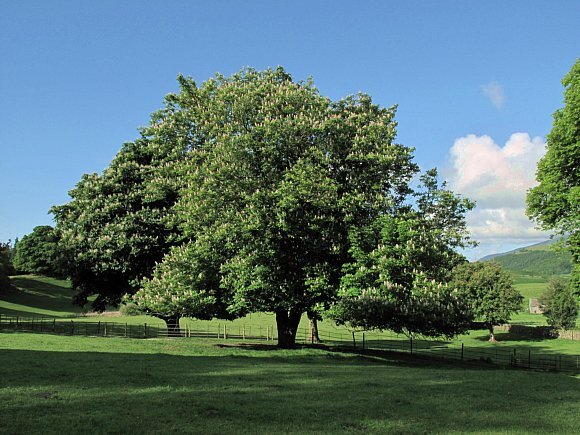 Britain now has two million Horse-Chestnut trees. The flowers are quite complex to observe. They comprise two types of flowers, those with red patches, and those with yellow patches. They are hermaphrodite, having both male and female flowers on the same plant. They are pollinated by bees. Seedlings readily form, but they hardly ever progress to become saplings or trees. 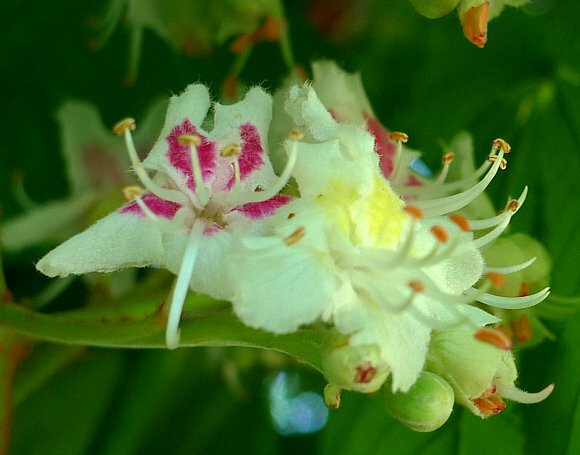 The Horse-chestnut tree grows outwards rather than upwards, giving rise to the words in a song 'under the spreading chestnut tree'. 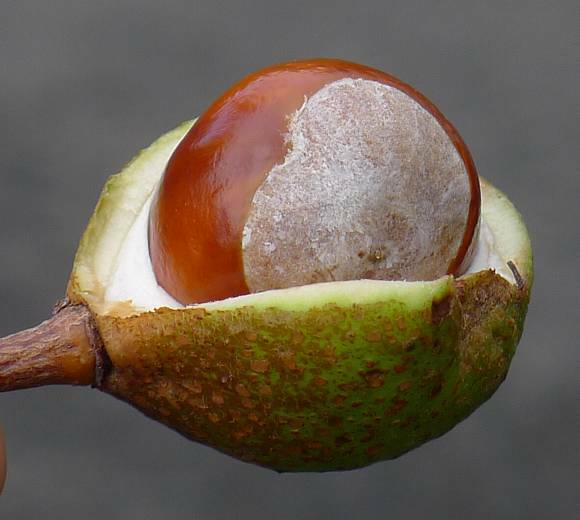 The fruits of the Horse-chestnut are what children obtain 'conkers' from, which are not the chestnuts used for roast chestnuts. The colloquial word 'conker' gives rise to the slang use of 'conk' for a 'head'. The word 'nut' for 'head' is derived similarly from the 'chestnut'. Conkers are mildly poisonous, containing saponins. 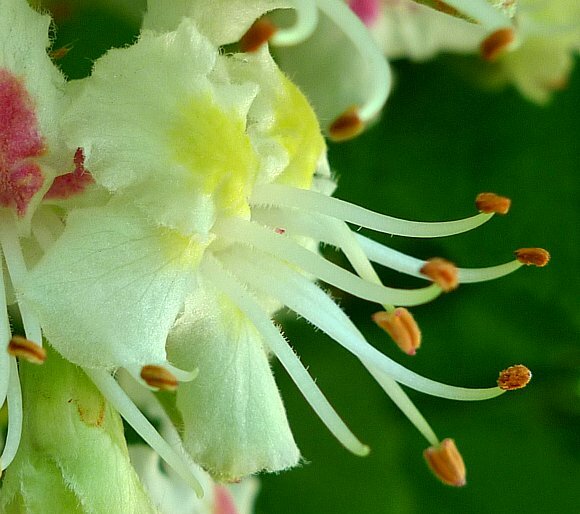 One such saponin, Aescin [which is actually the name for a mixture of saponins] (from the latin Genus name Aesculus for 'chestnut') is a powerful remedy for sprains and bruises. This vindicates the bygone use of conkers by the Turkish people for precisely the same ailment. 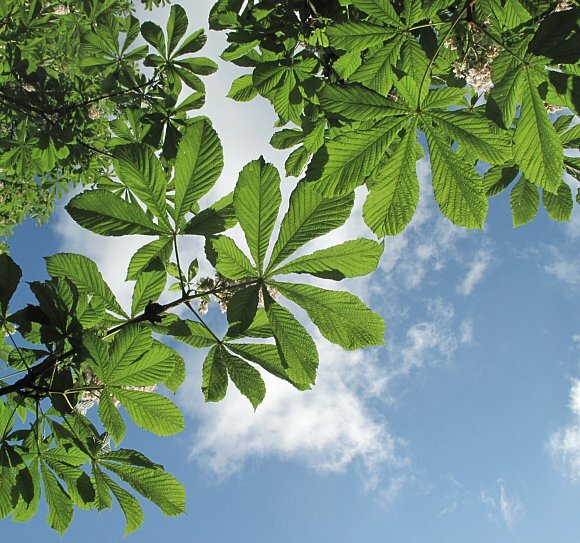 The natural saponins within conkers are also used by shampoo and shower-gel manufacturers in order to claim a 'naturelle' element to their products. Some children have died from poisoning after eating conkers mistaking them for sweet chestnuts, which they resemble. Horse-Chestnuts are under attack from the Horse Chestnut Leaf Miner Moth, Cameraria ochridella, which was first observed in Macedonia in the 1970's but which has since spread rapidly to encompass Austria and Central Europe, and now france and the United Kingdom when it was first observed in 2002 in Wimbledon, South London. Since that time it has spread northwards to infest trees over much of the UK south of Preston apart from much of Wales and the West Country. 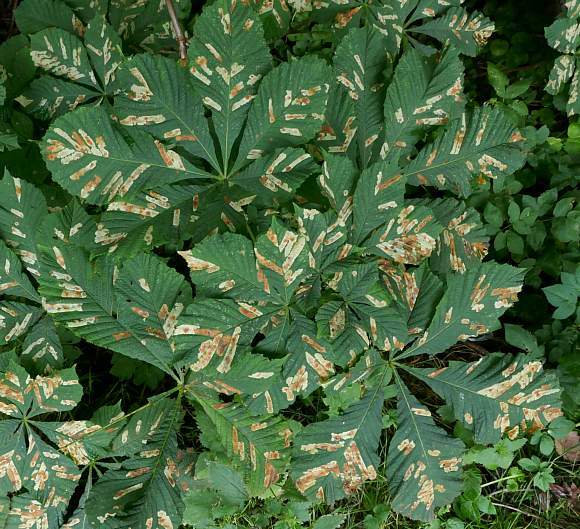 It is the larvae of the moth which feeds on the leaves of Horse-Chestnut Trees, giving them an autumnal look before they drop off, new leaves grow, and the new leaf re-invaded, this repeating several times in one season. But most of the damage occurs late in the growing season, and so does not overly affect the tree, the tree will not die nor does it need felling. The pupae if the moth are resistant to extremely hard frosts and can survive temperatures as low as -23C, so the recent hard winters of 2009 and 2010 did nothing to prevent their spread. 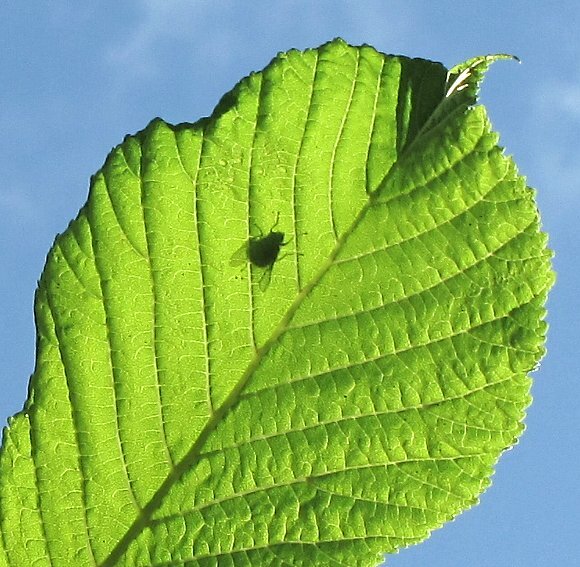 The attack on the leaves by the leaf miner moths make the tree more susceptible to attack by a bacteria that originates in the Himalayas. 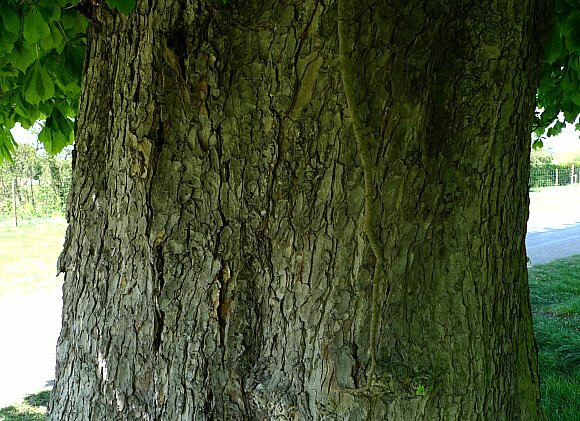 This bacteria causes a bleeding canker that makes the trunks bleed a sticky liquid which will kill the tree. No cure has been found for this attack on both sides. 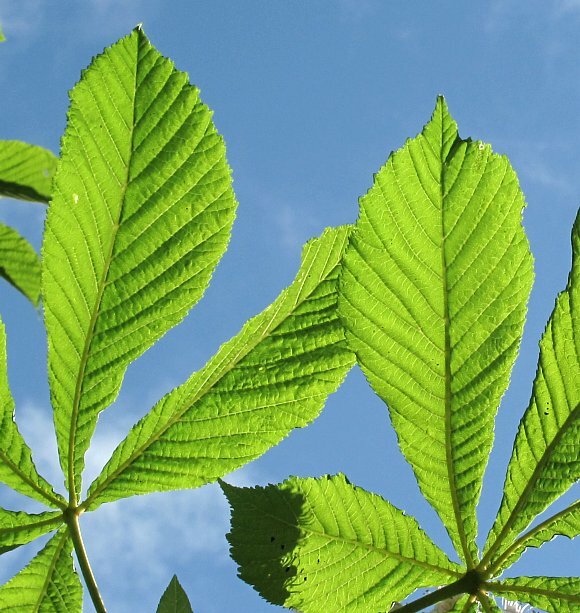 The damage to the leaf is similar, but not identical, to that caused by a fungal infection that affects Horse-Chestnut tree leaves: Guignardia aesculi. 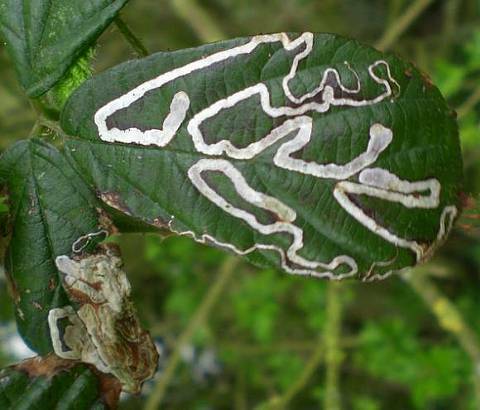 The damaged caused by the moths can be distinguished from that caused by the fungus by the yellow bands on leaves affected by the fungus, which are lacking in those damaged by the moths. That is, the fungus causes yellow and reddish-brown patches on the leaves which do not respect the veins and can therefore cause irregular blotches which spread over the veins with impunity. The moths can be controlled by the use of the systemic insecticide Fenoxycarb which kills the pupae leaving bees largely un-affected. Fenoxycarb is a synthetic insecticide based on carbamate, but acts in a way differing from other carbamate insecticides. Toxicity to bees birds and humans is low, but it is toxic to fish. It works by preventing immature insects from reaching maturity. Leaf Miner damage on Bramble Leaves (upper surface). This miner seems to have trouble mining through the larger veins but does manage it occasionally. 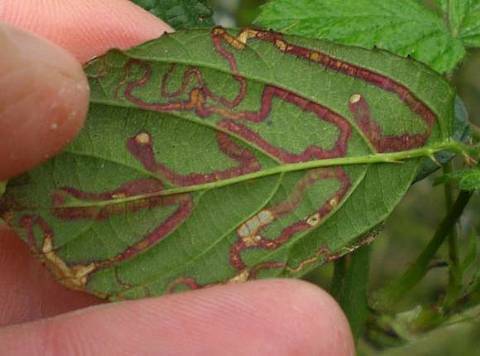 Leaf Miner damage on Bramble Leaves (lower surface). Note how the organism gets fatter and able to much a wider track through as it progresses. Because there are 4 large endings, there might be 4 miners within this one leaf. A protogynous flower is where the stigma is receptive to pollen before the anthers open and release their pollen, during the interval the stigma becomes unresponsive to pollen. Thus self-fertilisation is again thwarted. 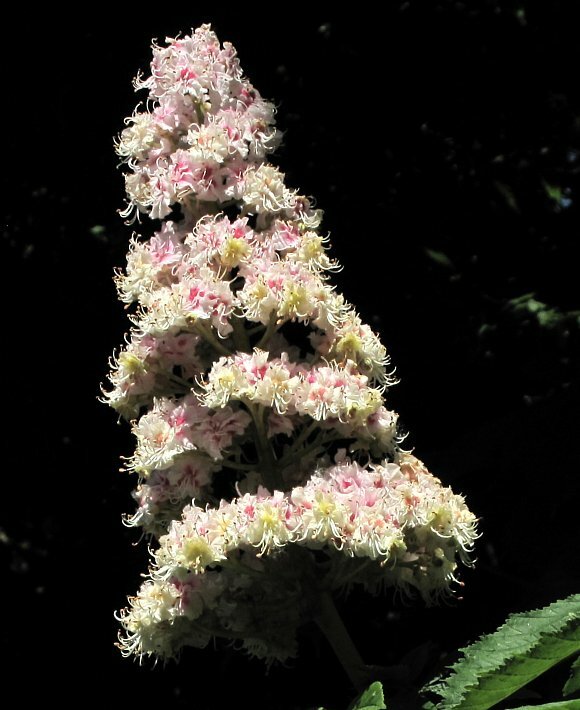 Examples of flowers exhibiting protogyny include the flowers of Figwort , Plantain , Christmas-Rose (Helleborus niger), Horse Chestnut (Aesculus hippocastanum), Magnolia , Hortonia and Daphnandra . The seeds contain a mixture of triterpene saponins known collectively as Aesin and present at up to 5% by weight (dry), one such of which is β-Aescin. 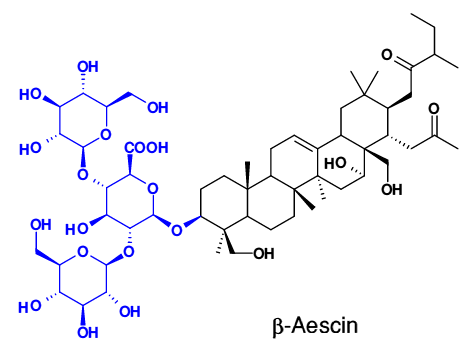 β-aescin, a triterpene saponin, is the main component of aescin, and has a structure similar to β-Hederin. 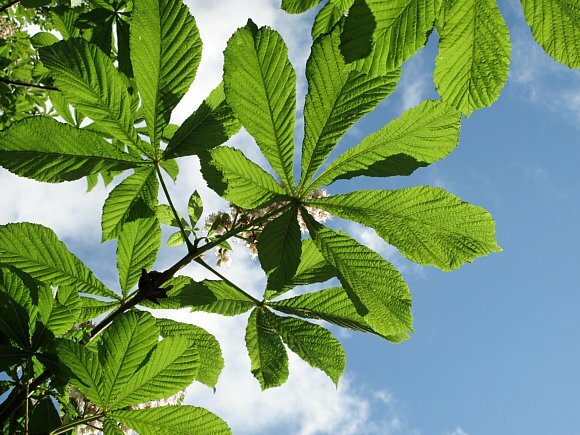 Aescin is an anti-inflammatory drug used pharmaceutically, and obtained from the Horse-Chestnut Tree. The sugar units of β-Aescin are shown in blue. 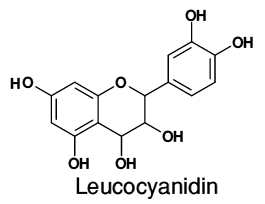 Aesculin (not to be confused with Aescin, the triterpene saponin as shown above) is a poisonous coumarin glycoside, related to 4-hydroxycoumarin, from which modern rodenticides were originally developed, such as Warfarin, a bi-coumarin . 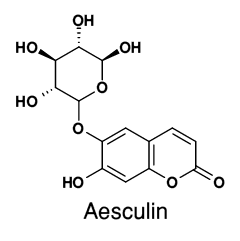 Aesculetin, is the direct coumarin pre-cursor of Aesculin. 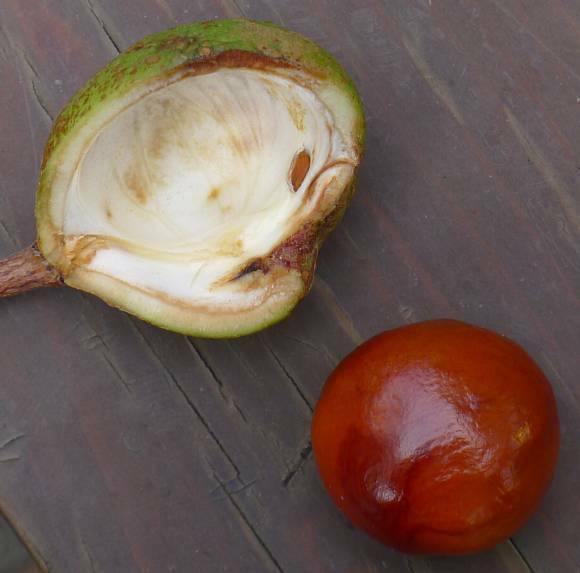 During the World Wars, conkers were gathered to extract the starch from them, which was subsequently converted to Acetone using a process invented by Chaim Weizmann. 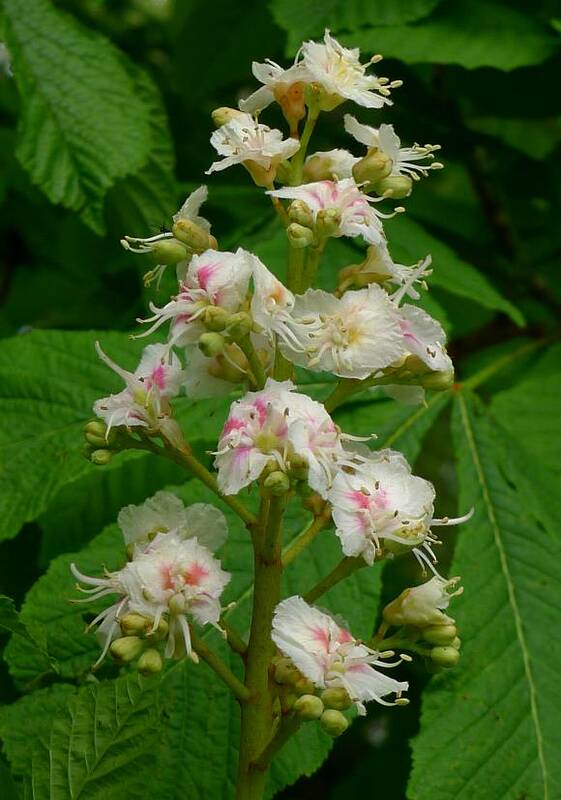 Horse-Chestnut also contains LeucoCyanidin , a colourless anthocyanidin compound based on Cyanidin, is also to be found in a number of other trees such as Bay Laurel, Black Locust, Common Oak and numerous other plants such as some Mallows, some Docks and Cacoa. 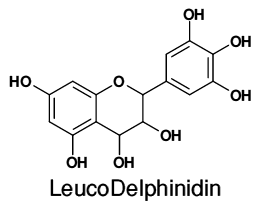 LeucoDelphinidin , which is based on Delphinidin, is also a colourless anthocyanidin found in Horse-chestnut. It is also found in Hop (Humulus lupulus), Pedunculate Oak (Quercus robur), Sea-Buckthorn (Hippophae rhamnoides) and Broad Bean (Vicia faba). 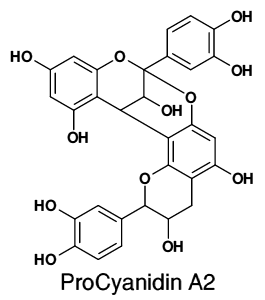 ProCyanidin A2 is an A-type ProAnthoCyanidin - a dimer (albeit asymmetrical) which is found in Avocado, Cranberry juice, Lychee fruits, the skins of Peanuts and a number of other non-native plants.